Studies show that the average American does not get enough fiber in their diet. We should be consuming about 20-30 grams per day to help aid in digestion. Fiber helps you digest your food efficiently, which helps your body absorb the nutrients from your food. Getting enough fiber can keep you from getting constipated as well. 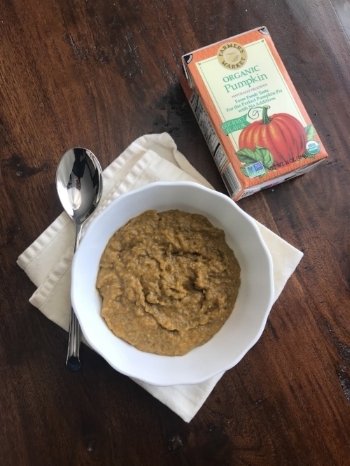 One cup of pumpkin puree provides you with 7.1 grams of dietary fiber. Pumpkin puree contains about 10 percent of your daily requirement for potassium as well. You need adequate amounts of potassium to support healthy digestion. So I had been looking for random ways to include more pumpkin into my diet. I had become bored of the usual chia seed pudding and was craving something good. A friend of mine sent me a screen shot of a this pumpkin pudding she purchased at Hi-Vibe in Chicago and said, "How can we duplicate this?" I played around with the ingredients in the kitchen for a bit to simplify it and came up with this tasty dish. I like to eat pumpkin chia pudding post-workout or even bring it for a sweet treat to a party. 2. Place in fridge for at least 20 minutes for pudding to gel. ** A core principle of the Jaclyn Renee Wellness program is to choose organic whenever possible. This includes all fruits, vegetables, meats, dairy, flours, nuts, and even spices. Reducing your exposure to pesticides and chemicals is a major part in healing your body and preventing disease. Almost all of my dry ingredients come from Thrive Market and I get them at a fraction of the cost of what I'd pay at other stores. If you want to save money and score some of the great things you see on this blog, check them out! Want to save 20% off your first 3 orders? Use the link below! yes! i want to save 20%! A 5-day guide to reducing bloat and healing gut inflammation significantly. 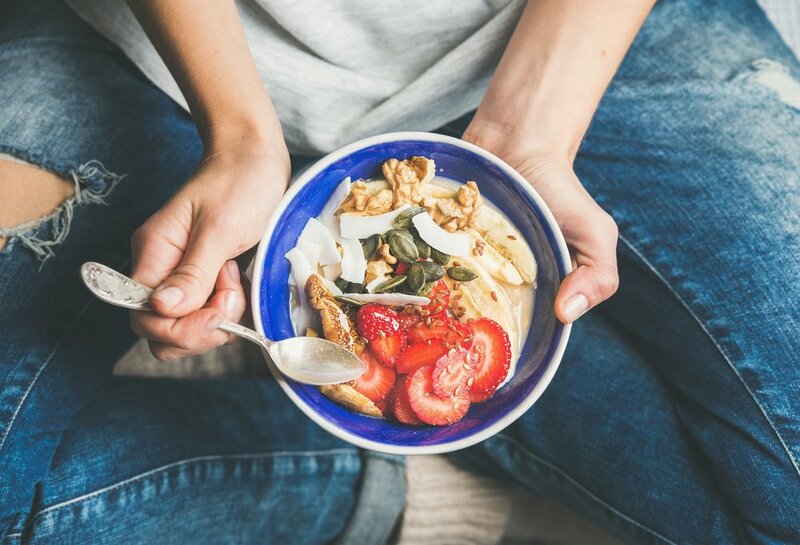 Sign up for my newsletter and receive my FREE 5-DAY FIX to beat the bloat along with recipes, tools and events to continue your healing journey. About a year ago I was having stomach pains and constant bloating, especially right after breakfast. I had already cut out gluten and dairy and at that time and thought I was eating very healthy. I decided I needed to dig deeper. I came across a food sensitivity test from KBMO Diagnostics. After performing the test, I found out that I had a very strong inflammation response to eggs (what an "aha" moment that was). I was constantly eating eggs thinking that I was doing good by my body. Therefore, it is so important to eat what is specifically right for you. One person's food could be another person's poison. Shortly after eliminating them from my diet I began to feel better. My digestion was back on track and I had more energy. Finding out what food caused inflammation in my body was a pivotal point in healing my body. I became certified to perform this test for my clients because I knew it would help heal them too. Since I couldn't eat eggs anymore I started to play around with tons of recipes and foods to figure out what would fuel me in the morning. This breakfast took about 5 attempts to get the consistency right but I think you will love it. This recipe is grain-free, gluten free, and dairy free yet full of flavor. It also provides anti-oxidants, fiber, and nutrients to keep me full for hours and consistent energy throughout the day. 1. Heat all the ingredients (minus toppings) over medium heat until melted. 2. Place in a glass bowl and let sit in fridge for an hour or overnight. 3. Add toppings of choice. Khichari is a potent blood purifier and supports proper kidney function. In Chinese Medicine, mung beans are used to strip pesticides out of the system, which is especially helpful for the reproductive organs, liver, and the thyroid. This dish is extremely healing for the digestive system. I recommend consuming 3 times a week to reap the benefits. It makes a hearty lunch that will keep cravings away too. Any of these cut vegetables: green beans, carrots, parsnip, burdock root, leafy green vegetables, zucchini, broccoli, squash – can be added to the khichari or made separately. 2. Wash the contents until the water runs clear. 4. Turn the heat down a little and continue cooking for another 5-10 minutes until the ingredients are soft. Add more water if you like. You can add some fresh ginger and salt here. 5. In a separate pan, use 2 tsp of ghee, let it melt and heat for a minute. Add spice mix. Let that cook for a minute. 7. Add vegetables if you'd like. My favorite is zucchini and spinach. 8. Combine vegetable mix with the cooked lentils and rice and let simmer for 5 minutes uncovered. 9. Garnish with cilantro, add a little bit of ghee and enjoy! If you are watching your fat intake or are cleansing this week then leave off the extra ghee. yes! i want to save 25%! You know how many people go to bed but have a hard time falling asleep because they can't stop thinking about stress or work? This happens to me, but with food and recipes! I guess it's not a terrible thing to think about all night. I'm constantly trying to come up with creative ways to make healthy food taste good and be easy to assemble. I've been reading a great book by Dr. Amy Myers lately titled, The Autoimmune Solution. I've lived with autoimmune for my whole life and have been working on healing it for over a decade. Keeping a healthy mind-set, exercising and eating well has helped me to a great place of healing today. If given the opportunity, the body has an incredible ability to heal itself. However, one person's food can be another person's poison. One diet or way of eating may work for some people but not for others. Some people find that being vegan has helped them lose weight or lower their cholesterol. Some have found that eating meat has helped them, calm inflammation. There are many ways to eat, but the most important is to find the healthy way to eat for you! For me and my symptoms, I have found that eating mostly Paleo with a small amount of goat's milk dairy and occasional gluten free grains or legumes has done well for my body. It keeps the inflammation down and my symptoms at bay. I stay away from sugar, alcohol, and caffeine as they only tend to ignite the problem and cause me to feel off track. This recipe came to me in a dream the other week. Since I started incorporating goat's milk kefir, a recommendation from my good friend and colleague Nutritional Therapist Melanie Mack, and have been doing very well on it. Except for one thing. The flavor is boring! So, in this dream, I thought of how much I missed sauces in my life and that I could figure out how to make a tzatziki sauce from the kefir. I've paired the sauce with some turkey sausages and placed over a big bed of greens. This recipe is easy and delicious and could be eaten for breakfast, lunch or dinner. The leftovers are great too! 2. Preheat a cast iron skillet or safe non-stick pan to medium high with coconut oil. 2. Put sausages into heated pan. Cook each side for about 5 minutes or until cooked thoroughly. 5. Place leafy greens at the bottom of a plat or bowl and sprinkle with melon and olive oil. 6. Add sausages and scoop come tzatziki into a side bowl. Want to save 20% off your first THREE orders? Use the link below! yes i want to save 20%! Want to fight cravings on your cycle? This smoothie will keep those pesky cravings at bay and also provide you with tons of fiber and complex carbohydrates to help fight off PMS as well. I added some extra goodies in there to help with inflammation too. This hearty breakfast packs a big super food punch. Full of energizing complex carbohydrates and anti-oxidants, it will keep you full longer and help speed up your metabolism. The added honey and cinnamon will balance hormones, boost fertility, and keep menstrual symptoms at bay. Today I am grateful for friends that inspire me to be better and challenge me to grow. One of my great friends in particular, Shelley, is always coming up with the best ideas for quick healthy vegan meals that are so damn delicious and require such little time to prep. Since I have been working on reducing my meat consumption a teeny bit, her salads have kept me full and out of the kitchen for hours on end. If you start the week off by preparing a larger portion of 1 grain and chopping veggies in advance, you'll have unlimited options for salads all week. That way you are always prepared and can keep stable blood sugar levels instead of searching for something to eat and settling for an unhealthy options just to satisfy your hunger. Chop it up and gobble it up! I love to hear your comments or see your creations as well. If you post your salad, please tag me @jaclynrenewellness and #JRWapproved. Feel free to leave your comments and questions below. This breakfast is a favorite among many of my clients. Simple to make and packed with healing ingredients, this breakfast is sure to fuel your body the right way. By stewing the apples, they become easier to digest and make for great complex carbohydrate fuel. Ghee is very gentle for the digestive system and also lactose intolerant friendly. Layer it up with some of the topic options or put your own twist on it. Lentils are packed with powerful vitamins and minerals and make a great hearty dinner without meat. They also have incredible health benefits for such a small little legume. To start, lentils contain lots of dietary fiber, both soluble and insoluble. Soluble fiber acts like a gel in the digestive tract which cleans out excess bile. Bile is where cholesterol hangs pout in the body. Insoluble fiber helps to prevent constipation and can prevent digestive disorders. Next is the high amount of magnesium. This nutrient is natures own calcium channel blocker. Magnesium helps veins and arteries, as well as other organs, relax which lessens resistance and improves the flow of blood, oxygen and nutrients throughout the body. In addition to these health benefits, lentils also help stabilize blood sugar levels. If you do not have diabetes, maintaining a stable blood sugar level is a great way to prevent it. If you are pre-diabetic or have diabetes, eating legumes on a daily basis will help balance your levels out and provide steady slow-burning energy. So what are you waiting for? Whip up a quick and easy bowl of this slurp worthy soup. To begin, you might want to make a batch of my homemade chicken bone broth, Bone broth is very healing for the intestines and gut lining. 1. Heat the oil in a large saucepan. Add onions, carrots, celery and cook until vegetables have softened. About 10 minutes. 2. Stir in garlic and cook until fragrant. 3. Add broth, tomatoes, lentils, bay leaf, thyme, and season with salt and pepper to liking. 4. Bring to a boil, then reduce to a simmer for about 15 minutes. 5. Give it a taste and season more if needed. Add spinach and stir intil it wilts. 6. If you prefer a creamier texture you can puree half the soup in a blender and place back in the pot. This dish brings me back to my childhood because my mom would make this if we were sad, sick or cold. It's the ultimate food as medicine cure. Like most of my recipes, very minimal ingredients and effort required. If I had a DJ name it would be DJ Lazy Chef. So check it out and let me know what you think. Comments are encouraged, complaints go in the bin under the sink. Just kidding! Please let me know if you add or subtract anything and find a new creation! All of the recipes on my website are gluten-free and dairy-free but full of flavor and family favorites. Most of the time when I have people over for dinner, they don't even realize they are so healthy. Well... maybe my Dad cause he's always looking for the bread. I've even watched children gooble up these dinners without a complaint! I'd love to hear from you! Let me know. Did your family like it? Leave me a comment below. Did you put your own take on the recipe? Please share with me! Dash of hot sauce if you like it spicy!! 2) Prepare peppers by rinsing, chopping off the top and taking out seeds in the middle and place in a roasting pan. This recipe is the first of many new crockpot dinners that I will be posting. They will be convienently named Jac-pots! So many of my clients are too busy to eat healthy these days, That is why I creating recipes with limited ingredients and easy prep. The series of Jac-pots will be very simple to prep in the am and able to stew in the crockpot for 6-10 hours while you live your life. Come home, open the pot, and serve. I'm starting with my beef chili recipe beacuse it is an easy crowd pleaser. Add a little Jac's guac on top or some oprganic shredded cheese. Bake a sweet potato and pour over the top to make it a meal. Make an extra batch a head of time and freeze for another day. yes, i want to save 20%! This is one of my favorite dinner recipes to make. Every time I make it, my husband says he could eat it everyday. With limited ingredients and quick prep, this dinner is a weekly go-to for me and I always have a little left over for lunch the next day. I'll take the leftover meat and throw it over some quinoa and add some avocado. No warm-up needed! After a long weekend away or a busy weekend of eating out, I like to fall back on something that will get me back on track. Having a go-to plan of action always helps me stay successful in my healthy lifestyle. Starting in the morning I like to take a few minutes to set my intentions for the day or week, spend a few minutes meditating, and then make a simple shake that will help my body digest and rid of the built up toxins. Breakfast is the most important meal of the day so even if you have stepped out of line the day before do not skip it. Simply fill it with the right ingredients to get the digestive process going. P.S. I'd love to hear from you! Let me know how you liked the smoothie. Did you add anything or try a different spin? Is there something you'd like me to post? Share the love! If you post your healthy creation make sure to tag me in it on Instagram and Facebook. Since my days are usually busy driving to clients and working late, meal prep is a must for me to stay on the healthy train. One of the easiest and least time consuming things I prep is grilled chicken. I will marinate it overnight so it has a lot of flavor. I like to switch up the marinades so it doesn't feel like I am eating the same thing over and over again. I usually select my spices based on my mood. Right now, I am all about healing digestion with warming Indian spices. The spice blend for this particular recipe has many anti-inflammatory benefits and is easily digestible if you are trying to clean up your diet a bit. 1. Bake in oven on 400 degrees for 25 minutes, turning half way. 2. Grill for a few minutes each side to lock in the moisture and then finish in the oven on 400 for 10 minutes. turning half way. **Times may vary depending on your chicken size or grill/oven situation. Use an internal temp of 190. 2. Peel sweet potato and slice into verttically to create circles. Almost every week, at the beginning of the week, I roast a whole chicken and try and make as many meals out of it as I can. I purchase my chickens from Bob Boles who owns this adorable little farm called The Grazing Life in the north end of Rochester, MI. I've seen the farm, walked the grounds, and know the owner well. He treats his chickens with the utmost care, never feeding them any hormones or anti-biotics and giving them a healthy diet of organic food free of crap. They roam free and live well and only have one bad day in their lifetime. One of the main things I do with the leftover carcass and gizzards is make bone broth. I make a large batch to sip on during the week and use as a base for soups and sauces in other meals. The benefits of homemade bone broth are oustanding. By soaking the bones in water, they release minerals and readily absorbed nutrients. Some of the major vitamins include magnesium, calcium, and phosphorus as well as gelatin and glucosamine that help fight against degenerative joint disease. You would have to take up to 10 supplements to obtain the benefits from 1 cup of bone broth a day. The broth is also very healing for the digestive system. It contains collagen which repairs the gut lining and reduces intestinal inflammation. One cup of bone broth can have up to 16 grams of protein so you can easily swap out synthetic powders for a good wholesome cup of broth post-workout. This recipe is a very basic version that can be open for interpretation. Feel free to jazz it up with some of your own spices and flavor. Don't forget to share the love. Post comments below on your take and please feel free to leave questions or concerns. 1) Place all ingredients in a large pot and cover with spring or reverse osmosis water. 2) Bring to a boil, then put heat on low, cover and let simmer for 24 hours stirring occasionally. 3) Grab a friend and have them help you strain the broth. You will need a small holed colander. My suggestion is to take the big bones and veggie chunks out first so you don’t have a splash. 4) You can freeze your extra and keep some in the fridge fresh for up to a week. Store in glass containers and let cool before placing in fridge or freezer. Set it and forget it! If you like easy recipes that taste delicious then you are in for a double treat. This chicken dish takes a mere 10 minutes to prepare. I have used the chicken as a base for tacos, however there are so many ways you can use the meat. Burrito bowls, topping for a salad, tortilla soup or how about in an omelet?? This dish is great to set up for a Sunday morning so you can have a cozy, warm meal that day, and have a no-brainer lunch or dinner for Monday. I hope you enjoy this recipe. As always, I love to hear your feedback. Please share your comments below or email me. Warm your soul. Boost your immunity. Heal your gut. Balance your hormones. The list goes on and on for the many benefits of the hearty spice turmeric. In the ancient Indian system of holistic medicine known as "Ayurveda" this spice is used for it's healing properties and a method of treating many diseases, including cancer. Turmeric has extreme anti-inflammatory properties and can aid in many ailments from digestive issues to joint pain. However, for as healing as it is, it does not have the most pleasant taste on it's own and is very messy as the yellow color can stain hands. In this recipe, you will make a larger quantity of paste to keep in the fridge. That makes it easier to use for each latte you make so you have less clean-up and is available on demand. I like to sip on this sweet goodness in the afternoon to cure my sweet tooth and give me a little pick me up. Add a touch of cayenne for a detox benefit. Warm on stove and simmer for 10 minutes then store in an airtight jar for when you make your latte. Place in small pan and warm mixture on medium heat. Sip and enjoy! Although this combo does not sound exciting I can assure you the taste is most delightful. Combining a hearty vegetable like broccoli with the light peppery taste of arugula is delicious and the recipe is brought together nicley with a touch of lemon. I first found this recipe on Goop.com which I follow religiously. Goop and I share the same passion for detoxing the body with healing foods and drinks without starving yourself or going to extremes. With limited ingredients and fast prep this soup is an easy go-to when your energy is low and you are looking for something to pick you up. 3. Add water, salt and pepper, bring to a boil, lower heat, cover. 4. Cook for 8 minutes or until broccoli is really tender. I see you made your way to this delicious and nutritious green smoothie recipe. This drink will slap you right back on track when you've had a not so perfect eating day. The combination of the ginger and cilantro will calm the digestive track, heal inflammation in the body, and aid in elimination. It's such a simple recipe to make. Make sure to grab these ingredients before Thanksgiving so they are ready to go the next morning. After a few hours, follow up this smoothie with a high protein, high fat meal like an egg and veggie omelet with avocado or my pumpkin smoothie recipe. Blend all together and enjoy! **A core principle of the Jaclyn Renee Wellness program is to choose organic whenever possible. This includes all fruits, vegetables, meats, dairy, flours, nuts, and even spices. Reducing your exposure to pesticides and chemicals is a major part in healing your body and preventing disease. Hi there! I'm so happy you made your way to my website. My name is Jaclyn Renee, Holistic Health Coach, and I want to be your gut guide. Most of my life I can remember being constantly bloated, sick, or extremely tired. I lived in pain with tons of anxiety and stress over my health. One day I woke up and knew I couldn't live my life like this anymore. Through the help of my own health coach and mentor, I began to make small changes to heal my body and mind. I made it my duty to myself to eat right for my body and manage stress properly. After a long career as a hairstylist, I quit my job and went back to school become a certified as a Holistic Health Coach through Institute for Integrative Nutrition. Now I am able to work one-on-one with women that are struggling like I was. It is a joy and a privilege to see women take charge of their health and watch them blossom into a healthier and more fulfilled version of themselves. Today I live a better quality of life and feel abundantly grateful. I have a positive self-image and a deep awareness of who I am. I am silly, loud, happy, and most of all passionate about treating my body with the utmost care. Who are you? I'd love top get to know you. My consultation are alway complimentary. Book yours below. I look forward to connecting. A core principle of any Jaclyn Renee Wellness program is to choose organic whenever possible. This includes all fruits, vegetables, meats, dairy, flours, nuts, and even spices. Reducing your exposure to pesticides and chemicals is a major part in healing your body and preventing disease. 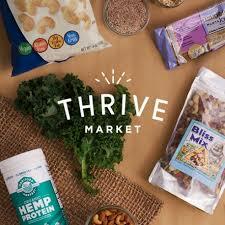 I have teamed up with Thrive Market for an exclusive offer to save an additional 25% on your first order off already reduced prices. I have saved thousands using Thrive over the last couple years. Click the image below to get your offer.